As I briefly talked about at the last meeting, we've been chosen to put together the raffle quilt for the Minnesota Quilters (MQ) 2017 show in Duluth. 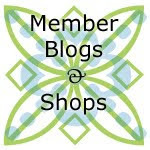 The purpose of this is to provide more exposure for our guild and the modern quilting movement in general. We (and MQ) believe it is important to try to bridge the gap between the more traditional and more modern quilting communities. Most people that attend the MQ show are of the more traditional flavor of quilter, so this is a great opportunity. This quilt is more of a blend of the two styles to try to appeal to both groups. 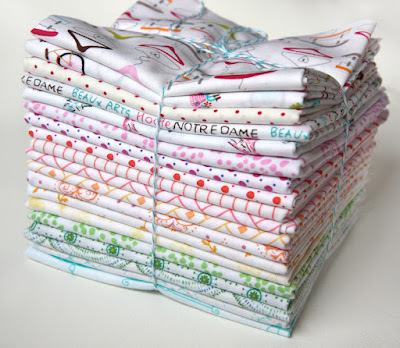 To provide a little incentive to join in on the fun, we have this lovely bundle of 19 colorful low volume fabrics that one lucky participant will win. These are all quarter yard cuts. The first six blocks submitted will get you an entry, and each additional three blocks (no limit!) will get you an additional entry. I'm hoping to receive too many blocks--the extras will get passed along to the Charity committee. ​The blocks are due and the drawing will be made at the May meeting, but I'll accept blocks anytime before that if you're done early! I If you'll be missing the meeting but want to participate, you can mail them to me at the address in the email I sent out. When you mail them or hand them off, be sure the group of them is labeled with your name with a piece of tape or similar so that your name goes in the drawing. I will be collecting the blocks and assembling the quilt top. We are still looking for a long arm quilter that would be interested in quilting it--if you are interested or know someone who might be, please let me know! PDF instructions for the block were sent out to all members via email. They are a subset of a pattern that will be available at the show. Each participant will also receive a copy of the full digital pattern around the time of the show next year. The fabric choices are described below. Background: (you can use the same background for up to six of your blocks): light, low volume prints (no solids). Because this is for a traditional guild, dial down the busy-ness of the low volume a little. Choose from white, off white, light gray, and cream backgrounds in the prints. Not so dark as beige/taupe or medium gray, the darkest would be about Kona Oyster or Kona Silver. The low volume fabrics can have soft color designs on a light background, but please no bold, black, or dark accents. Below is a photo of two stacks of low volume-ish fabrics. 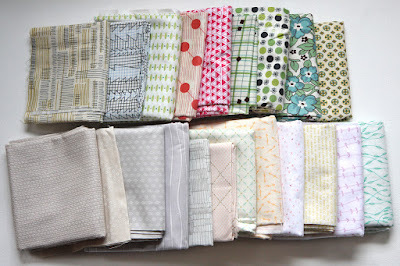 The top stack of fabrics are too busy, dark, or have elements that are just too bold or distracting. The bottom stack is more what we're looking for. Stars: Nearly any color of bright or dark prints, as long as they contrast well with your background. The prints you use for the outer round of the star should read as a solid block of color or multicolor--meaning that other than small accents, there should not be any white or very light in your prints so the crisp star edge doesn't get muddled. Try to avoid using many neutrals like brown or gray. Sparingly, pastels are fine as long as they contrast well with the background or are used for inner star rounds. No batiks please because they can bleed. Here's another example photo. The top stack of prints are all ones that won't work for outer star rounds--they have too much white/cream in them. 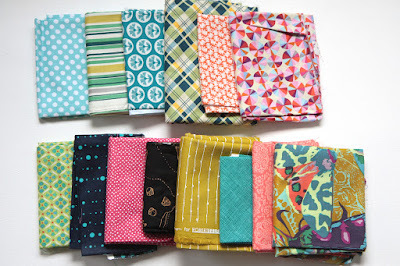 Any type of fabrics like those in the bottom stack would make a great choice. I didn't have a lot of large scale prints without white to show, but those are great too. Try to include some variation in light/dark and print scale in your choices. ​This quilt also doesn't have a name yet. If you have ideas, send them along. I'll be picking out a secret prize for my favorite suggestion. Ideas are due by the night before the May meeting so I can announce it at the meeting. Please let me know if you have any questions! Thank you so much for your help!